Rain Dance Slot Information, Screenshots and which online casinos offer Rain Dance Slot for Play. Dance amongst the cash that will rain down on you! This is a progressive jackpot game from RTG with a high entertainment value and good opportunities to win some very good prizes. 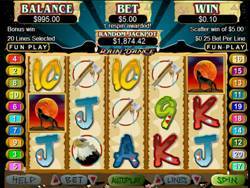 It is a 5 reel 20 pay line slot with symbols that produce typical icons of North American Indian life. The Wild symbol is the impressive Chief who is also a substitute for all other symbols. He only appears on reel 1 and 5 but he will double your win! The Howling Wolf is the scatter symbol and when you produce 2,3,4,or 5 of them across left to right reels you multiply your bet 1,2, 10 or 100 times. If it is really your day and the spirits are smiling at you, spin a wild as well and double your prize further! Free spins are won when two or more scatter symbols appear. This play locks the Wolf and Chief symbols and spins the remaining reels. Finding 3, 4 or 5 scatters during a re-spin will gain you up to 100 free games and prizes are multiplied by the number of scatters you triggered. There is a maximum win of 5000 coins but keep your eyes on the Rain Dance progressive jackpot – it is random and can be won at any time – it can happen!